If you’ve wanted to learn how to develop on SharePoint – or you’ve been told that you need to develop a solution that integrates with SharePoint, this introduction to SharePoint (2010) Development DVD is the training you need. 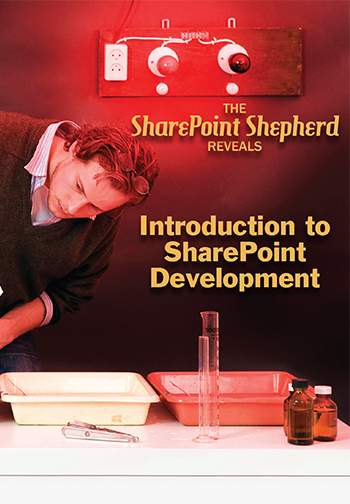 It’s quick, to the point, and effective at training how to develop with SharePoint. Travel costs and hassles mean that going to training at a specialized training organization or a conference is expensive and painful. Going to a local training center will be hit-and-miss in terms of the quality of the learning experience because it depends on the instructor’s experience with the material. Not to mention that the class is time consuming and disruptive to your work. Through years of experience with training developers, Robert Bogue has honed the key content that developers need to know into an elegant package. He won’t waste your time with conversations about where the semicolons go – you already know that. Instead, he’ll get straight to what you need to know as a developer who needs to know about SharePoint. If you want to learn SharePoint development do you want to do it from someone you’ve never heard of – someone that the community of SharePoint people doesn’t know or respect – or would you prefer to learn from one of the most respected leaders in the SharePoint community. The instructor for this course, Robert Bogue, holds numerous certifications and awards. He has been in the Microsoft MVP program for twelve years, is the only non-Microsoft team member for all three versions of the Microsoft SharePoint Guidance (http://www.microsoft.com/spg), is a Microsoft Patterns and Practices Champion, and is the author for the Microsoft Learning five-day course “Designing and Developing Microsoft SharePoint Server 2010 Applications.” Robert’s development background extends back beyond SharePoint with author credit on 25 books and editing credit on over 100 more titles dating over 20 years. He understands your challenges and speaks in a way that you can understand. The Introduction to SharePoint 2010 development is jam packed into four hours. It will set the right foundation for your SharePoint development experience. You’ll get two DVDs capable of being played in a standard DVD player or your computer so you can decide when and where you want to watch the video. The second DVD contains all of the project files for the code from the 28 demos in the course. You’ll get a framework for how to understand developing with SharePoint but more than that you’ll get to see exactly how to do the most common things that you will want to do with SharePoint. We’ll even refund your money if you don’t believe you more than got your money’s worth – because we know that won’t happen.